The 2016 AAE AZ CUP has come to an end. Many AZ JOAD Archers shot great despite the weather, and landed on the podium this weekend. Congratulations to all the archers who shot. AZ JOAD archers that made it to the podium. Ashlyn Merritt – Gold Qualifying, Silver Finals. Brian Bullis – Gold Qualifying. Cooper French – Bronze Finals. Jeremy Corridori – Silver Qualifying. Paxton LeSatz – Bronze Qualifying. Here is the link to the complete event scoring. Fun was had by all. Team Rounds and Head to Head Elimination rounds are always an archer favorite. This year had many combined age classes, which made for interesting matches. To end on a high note, we finished up with awards and made it out of there just as it started to rain on Sunday afternoon. Congrats to Mike Cullumber for being elected to the USA Archery Board of Directors. Mike will be acting in the Judge Director position. 5th Annual Copper Classic, November 2015. This tournament was originally designed to teach young archers the ropes of head to head competition. It since has evolved into a tournament that not only introduces new archers to this type of competition, it also brings together archers from all different archery disciplines, USA, ASA and NFAA. Many archers, who usually focus on shooting 3D, crossed over to enjoy this head to head shoot out. All competitors were eager to see how they stacked up against others they might face in Vegas. On Saturday youth archers competed in USA divisions Bowman to Cadet, with Sunday reserved for Junior’s to Masters. On Saturday I witnessed a few new archers starting to understand the idea of “The only arrow that matters is the one on your bow right now!” Even though you are down 4 set points to 0, you still have a chance to win, if you focus on just that ONE arrow. The nice thing about set points vs. cumulative points is one bad arrow won’t ruin the entire match. The First part of each day consisted of a 300 ranking round. The archers were then divided into flights of 8 to compete in head to head matches. The flights were determined by ranking round scores, regardless of age, bow, or gender. This was an excellent opportunity to truly see archers compete based only on ability. With the new “Inner Ten” for Compound rule change, competition was evened out. On both days recurve archers made it into the Top Copper Flight. Saturday’s overall 2015 Copper Classic Champion was Jeremy Corridori. Sunday’s overall 2015 Copper Classic Champion was Nathan Yamaguchi, one of Arizona’s Resident Athletes from the Chula Vista Olympic training center. The clubs own Chris Escarsega was top qualifying archer for Sunday, and Jeremy Corridori was top qualifying archer for Saturday. 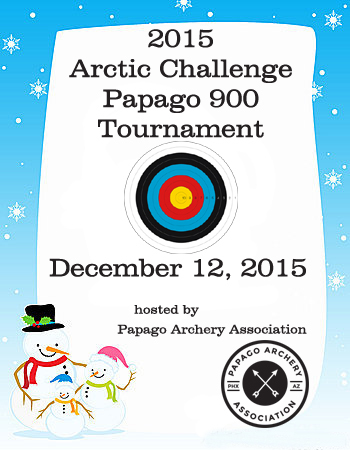 The 2015 Iron Archer is set to take place on December 5 – 6. Sign up fast, the tournament is a perenial favorite. Big Changes made to the Event. Copper Classic is now Inner 10 for compound, Outer 10 for recurve. There is NO Cut, all competitor who compete in the ranking rounds will be allowed to stay and shoot in the head to head competition. On November 7 & 8 Arizona Archery Club is hosting the Copper Classic. November 7th is for Youth, November 8th is for Adults. USA Archery schedule updated with Indoor National locations and Dates. USA Archery has updated their event schedule to include the upcoming 2016 Indoor National locations and dates. For those who are interested, here is the link to the USA Archery event page. The 2016 Tournament schedule has been released. There are a few events late in the year that have not been added to the schedule at this time. Please keep in mind that all Tournaments are subject to change by the event coordinators. Please make contact with event coordinators prior to making travel plans.